The Bobcat Chronicle: Dual Meet Recaps! Bates Wraps Up Weekend 4-2! 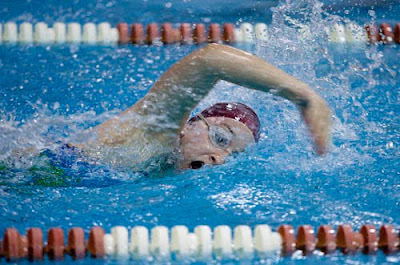 In a tough weekend of competing after 20 training session in 13 days, Bates Swimming and Diving wrapped a solid weekend of competition with 2 wins each for the men and women - and several stellar performances. The highlight of the weekend may just have been the women's 1650 with Kara Leasure and Tara Dugan posting the 1st and 3rd fastest times in the conference in an amazing race (See the final 200 below). I believe their ability to attack that race is a great indication of how well the team has trained - and how prepared our athletes are for a solid taper and shave come NESCACs. Dan Aupi continues to shine in the backstroke events posting some of the best time in the conference, and Katelyn Drake is still clearly on a mission for her third National Meet appearance. On the boards, Annaliese Rudis just missed her first NCAA provisional cut, and Travis Jones continues to improve and demonstrate that he could develop into one of the best around. Check out the write ups here (UNE / Midd) for more information! Thanks so much for posting this as we so wished we could have been there to watch it!